The Nättraby line was opened in three stages between 1893 and 1910. 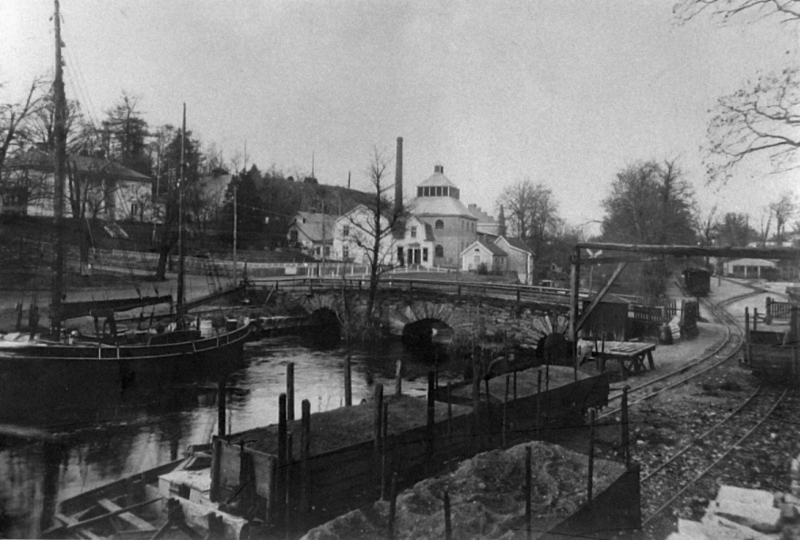 From Nättraby harbour, 10 km west of the naval town of Karlskrona, the line followed the Nättraby stream to the village of Älmeboda, 49 km to the north. Till 1939, when passenger traffic was discontinued, the line was the principal means of transport for freight and people between the coast and the forests in the north. From Karlskrona and the “big world” came commodities to the villages, and limestone, fertilisers and raw materials for local enterprise. Gravel and timber, farming products and metalware went back to the coast. Farmers travelled into town, Karlskrona citizens into the countryside. During summer weekends, all coaches were pressed in use, and wagons had to be equipped with seats. Four steam engines provided the motive power, six coaches the passenger transport. Freight stock consisted of some fifty wagons. Construction was initiated by a county councillor, Axel E. Lindvall. He resided in Nättraby, near the railway station and also owned the steam launches that linked the line to Karlskrona harbour.